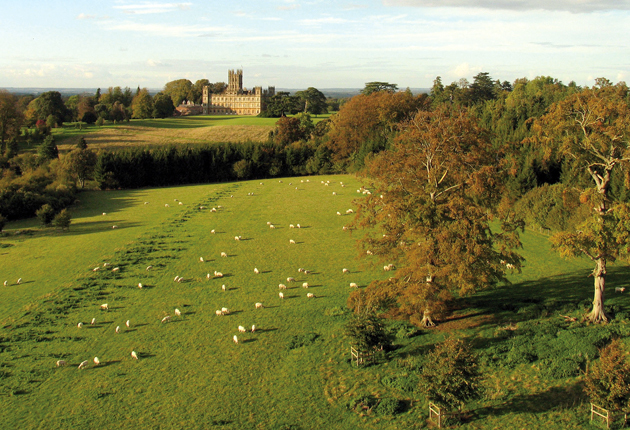 Great landed estates were symbols of the owner’s wealth and status in British society. Everything was put on grand display – from the exquisite architecture of the house itself to the furniture, jewels, silver plate, servants, books, carriages, horses, deer, game, forests, fields, and splendid grounds and gardens. Visitors arriving at a landed estate took a circuitous route to the house along winding paths that were designed to show the grounds to their best advantage. They would pass through wooded areas and open fields, past lakes and rivers and herds of deer or cattle, and through a controlled wilderness area. Groundskeepers of extensive parks that featured winding drives and a variety of formal and ornamental gardens employed several means of keeping grass under control. Grazing sheep and cattle represented the first lines of defense. These herds were allowed to roam over vast expanses of land. Eighteenth-century romantic sensibility required that nothing as obviously artificial as a visible fence be allowed to contain them. 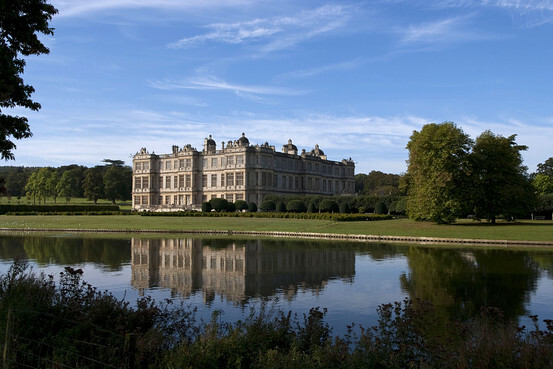 Highclere Castle is surrounded by park land designed by Capability Brown. Grazing sheep in the foreground. 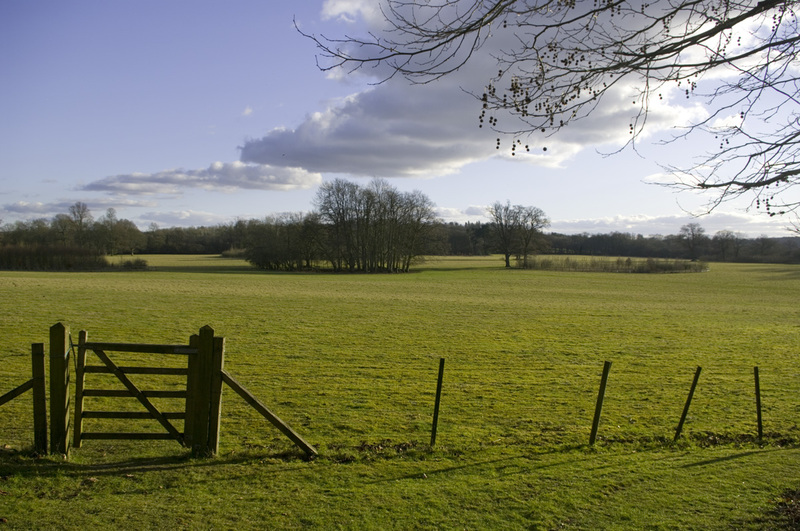 A landscape feature called a Ha-Ha prevented grazing herds from coming too close to the house. The Ha-Ha, which consisted of a deep trench abutting a wall and which was hidden from casual view even at a short distance, allowed for the naturalistic features of romantic landscape gardening to take hold. A Ha-Ha was so named because, as the myth goes, this landscape feature was so well hidden that an unsuspecting visitor would blurt out “ha-ha!” before falling into the trench. This cross section shows how the system worked. Not all Ha-Ha’s prevented deer, sheep, or cattle from grazing up to the front of the house (though considering their droppings, one would thinks that this would be highly preferred.) 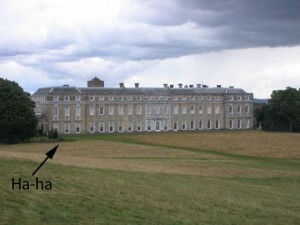 At Petworth, the Ha-Ha was placed at the side of the house. 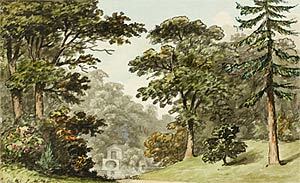 The transitional area between the formal gardens and the large park surrounding the house was known as the wilderness. 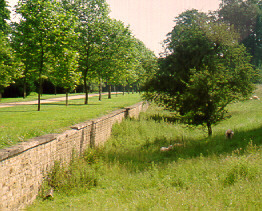 This area was as meticulously planned as the other areas of the estate, but here the plantings were more irregular and included native plants and trees; gravel walkways; a pond, lake or river or all three; waterfalls; lawns that resembled meadows; and areas where the vistas were framed to deliberately look natural. If cottages and villages were required to be moved to achieve this picturesque effect, then so be it. The master’s will was done. 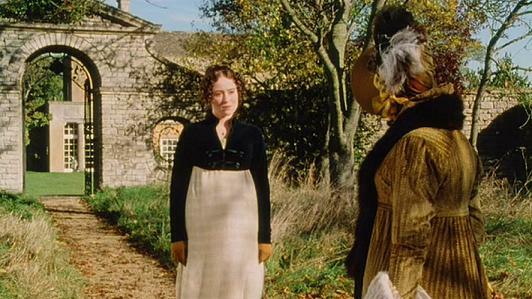 In Pride and Prejudice 1995, Elizabeth Bennet and Lady Catherine de Bourgh conduct their heated discussion in Longbourn’s “wilderness”. No grazing required here. These wilderness areas were unique to topography and region, for each estate was uniquely different. The exercise of walking along a wilderness ground was both visually and physically stimulating. These wilderness areas took years to design and arrange, with large trees moved from one area to another, buildings demolished or transported, and hillsides lowered or raised to “improve” the view. Sir Humphry Repton left a valuable legacy with his Red Books. 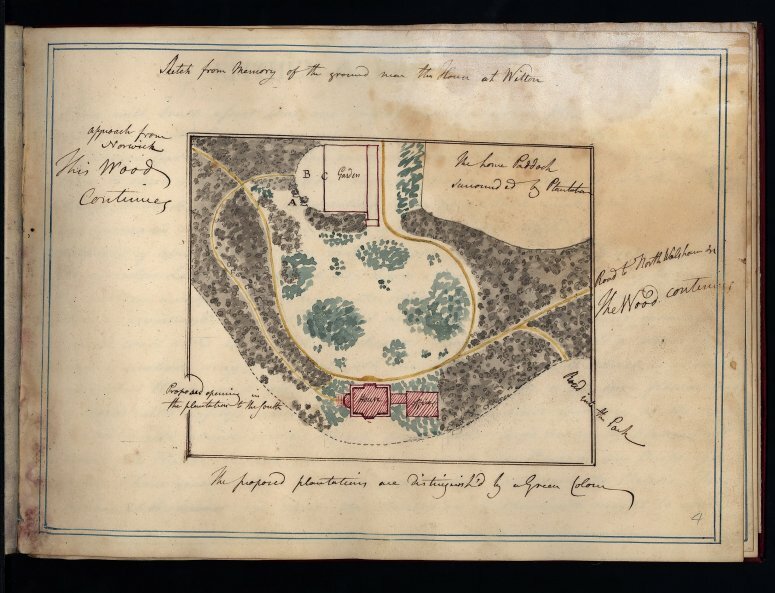 It was his habit to sketch before and after landscapes for his customers and present the drawings to them bound in red covers. His improvements for Whiton are subtle but important. Two parallel streams have been turned into a serpentine lake with a waterfall at one end. The distant fields provide a focal point with artfully arranged trees. If you look closely at the gravel path on the left, you can spy a gardener. 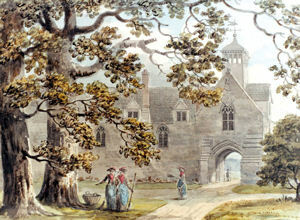 The samples below of Ferney Hall from The Morgan Library and Museum show the before and after drawing of an improved vista in which, using Jane Austen’s words, ” a prospect was opened”. The after image provides a glimpse of a folly. Instead of acting as a barrier, the woods give way to the scene, which provides a pleasant stopping point for the wanderer to sit and view. While such scenes looked natural, they were not. The wilderness was designed some distance from the house. 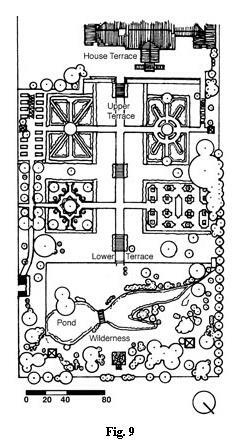 Approaching closer, the visitor would see a more formal arrangement of fountains and shrubbery and mazes and flower gardens. Landscape designs informed the process of maintaining the grounds. 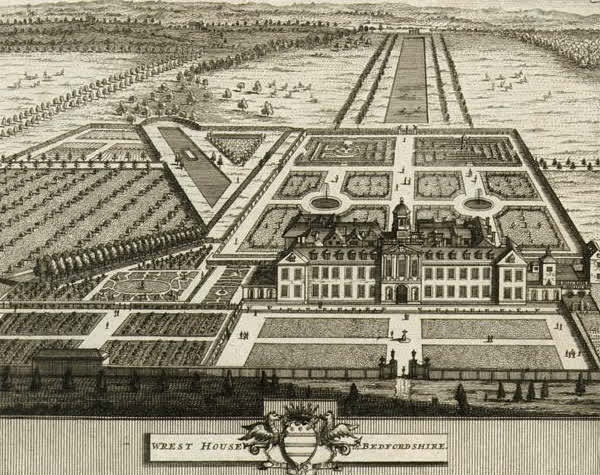 Large estates employed many gardeners to keep cricket and croquet fields in pristine condition, cultivate the ornamental and kitchen gardens, and oversee the orchards and hot houses. The question is: How did they do it? Lawn mowing and ornamental landscaping held no particular interest to 99% of the people who lived during the Georgian era. 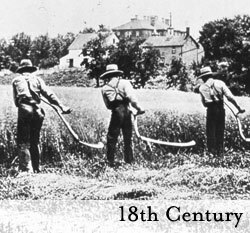 Cottagers and town dwellers maintained small plots of vegetable gardens and laborers worked in the fields, using scythes to cut wheat and grain for their employers. The laborers wielding scythes in the above image provide a clue to how grass was clipped – using a smooth, well-rehearsed motion, they worked in teams to cover large areas of ground. Their labor was cheap and they followed a system that included working in the morning when the ground was still damp. The secret to maintaining a close-cropped lawn was to trim it frequently, about once a week. Lawn edges were best trimmed with sheep shearing clippers. This gardening family is using shears, a rake, and a scythe in their cottage garden. 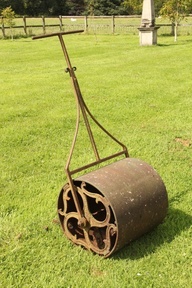 The grass was kept free of daisies with an instrument named a daisy grubber, which is the long-handled instrument with angled pick in the image below. Daisy grubbers are still sold today, as they apparently do the job well. 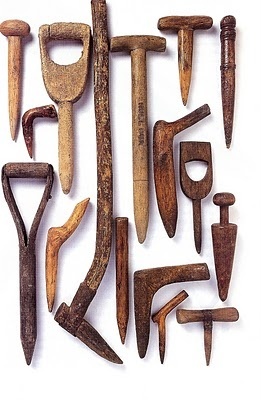 Dibbles were used to dig holes in the ground to plant seeds or bulbs, pry up roots, or jab weeds out between bricks and stone. 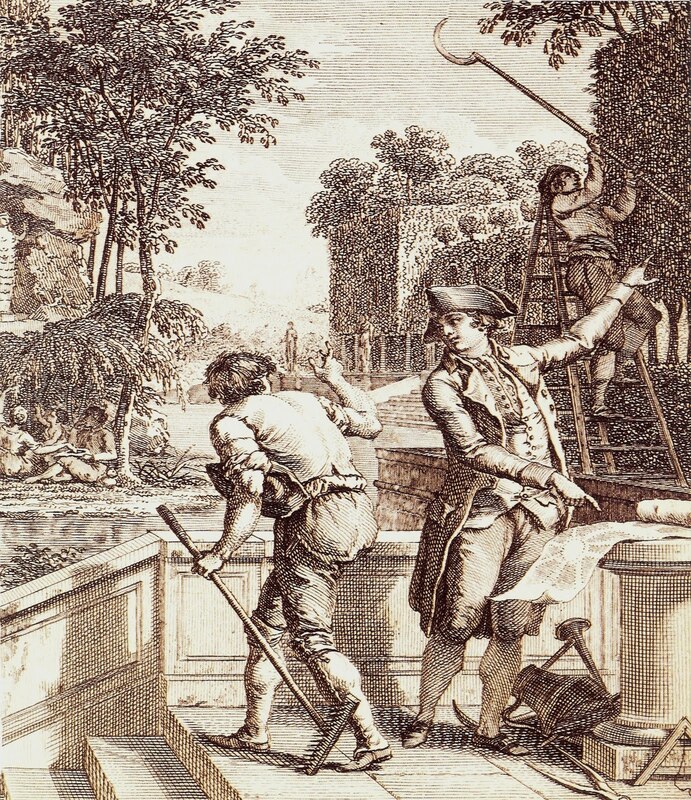 18th century gardener taking direction from a landscape designer. 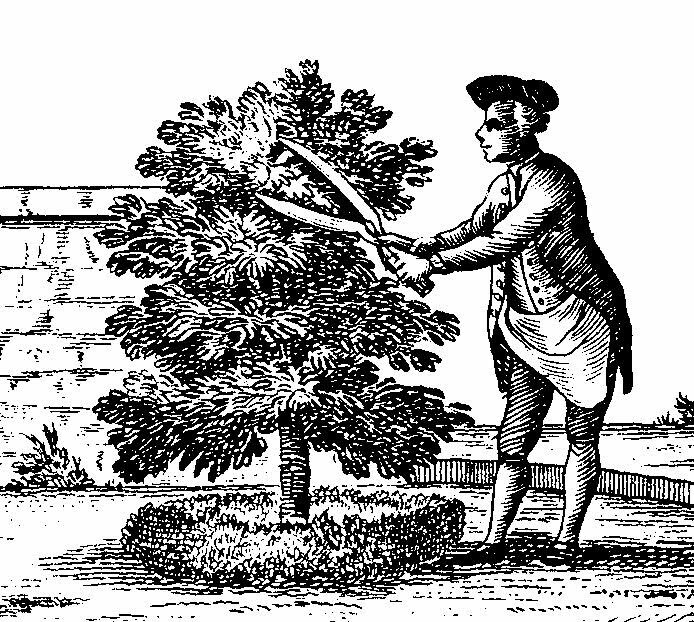 Note the man pruning the tree. 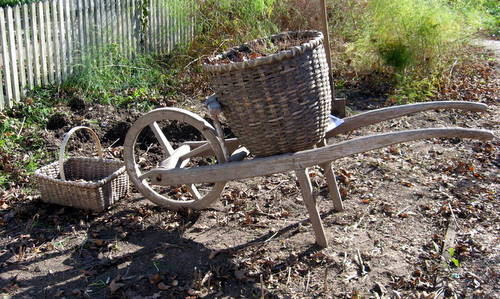 Even with these instruments, maintaining these large gardens took intensive labor. One can just imagine how much work was involved in protecting tender plants from insects and marauders, early frosts, and dry spells; and forcing exotic fruits and vegetables to grow out of season in hot houses. Engelbrecht. 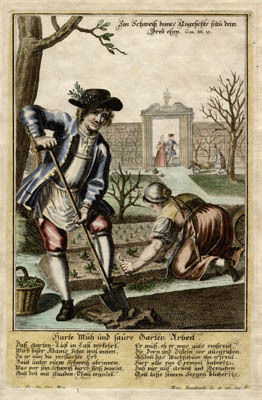 18th century German print of gardening – planting. “rich people used to show their wealth by the size of their bedding-plant list: 10,000 plants for a squire; 20,000 for a baronet; 30,000 for an earl and 50,000 for a duke. ” – Ernest Fields, Life in the Victorian Country House by Pamela Horn, p. 75. Landed owners showed off their wealth through a variety of means, including the number of servants they employed. 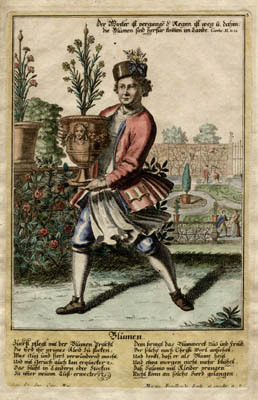 It was not unusual for a great estate to employ 60 – 100 gardeners. 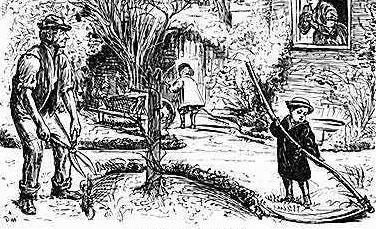 There was the full-time staff, consisting of a master gardener, who had begun his apprenticeship as a boy, and his assistants. 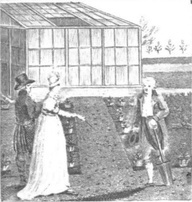 Scottish gardeners were preferred, as it was thought that they had received the best training. 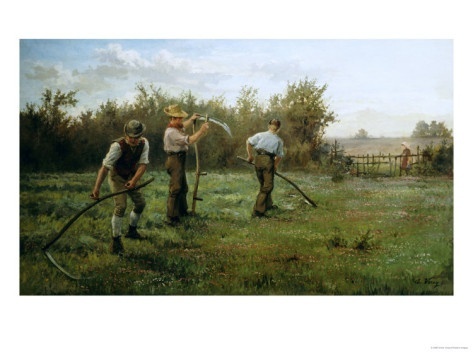 Unmarried apprentice gardeners moved from estate to estate in order to gain experience and be promoted. 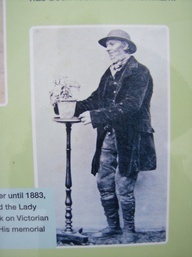 Junior staff worked long hours, around 60 hours a week, for, in addition to their gardening duties, they had to maintain the temperatures in glassed-in conservatories and meticulously care for archery, cricket, bowling and croquet lawns. The master gardener hired local labor seasonally to help during peak times, so the number of laborers fluctuated. 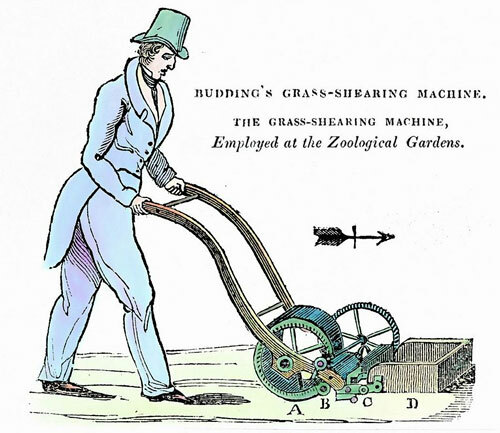 With improvements in gardening equipment, including the invention of the lawn mower in 1830 by Edwin Beard Budding, machines began to take over the hard work of the scythe men. 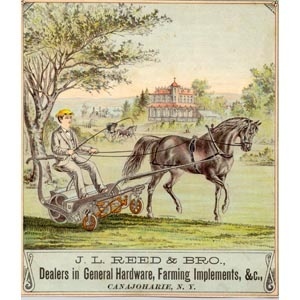 I imagined a Regency gentleman pushing one in his regalia, and found this wonderful advertisement. 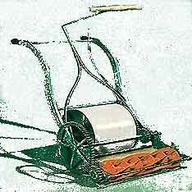 After Budding’s initial invention, a variety of lawn mowers were invented, each improving on the other. Needless to say, large areas of lawn needed a more efficient method of keeping the grasses trimmed. 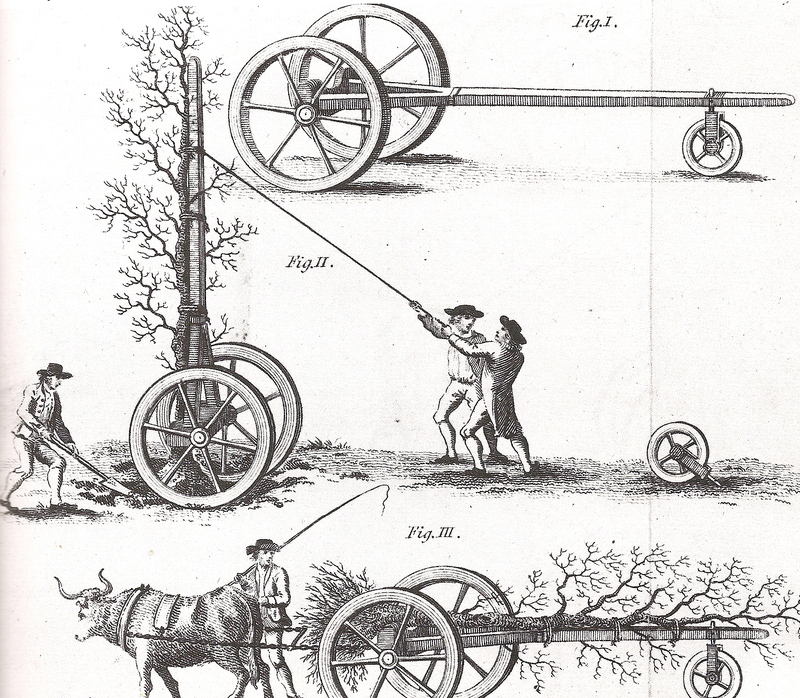 As the 19th century progressed, horses were employed to pull large lawn mowing machines. 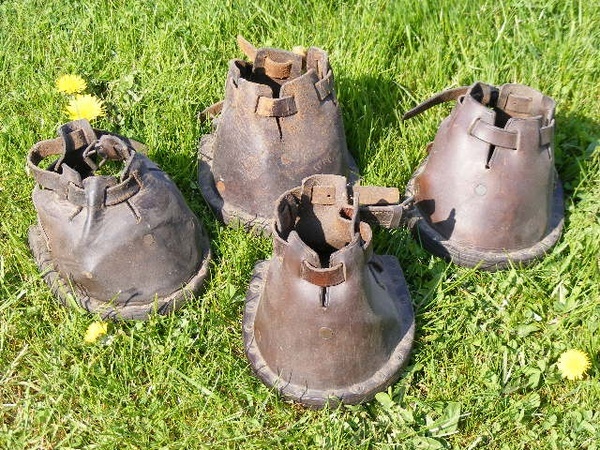 They wore special leather over shoes to protect fragile lawns, such as those shown in the image below. 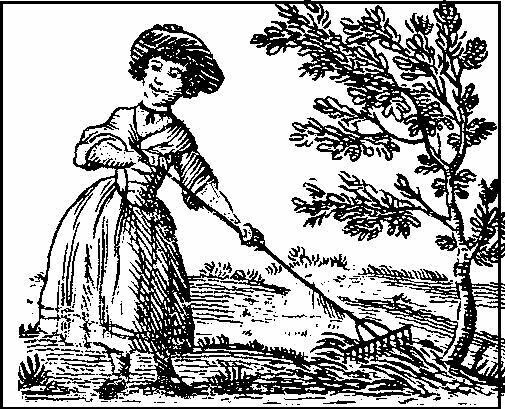 This short video on YouTube demonstrates how 18th century gardeners dealt with sudden cold snaps. This 1991 film about Repton’s career, which I found on YouTube and whose title I could not find, features Sir Michael Hordern as the narrator and John Savident as Repton. 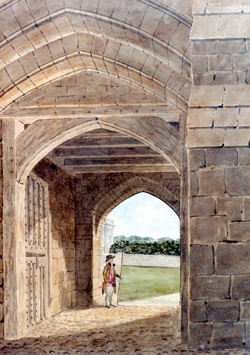 The special showcases Repton’s magnificent drawings for the redesign of many famous properties; some of his work can still be observed in their natural settings. 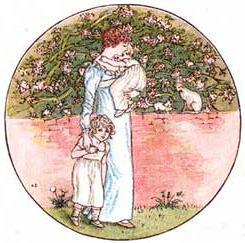 About the name: Is it Humphry or Humphrey? I have seen both spellings. The BBC spelled the name as Humprhey, whereas the National Portrait Gallery, Morgan Library, and the majority of sources use Humphry. Inquiring reader: This is the second post by historical paint expert Patrick Baty of Papers and Paints, who has carried out extensive research into the use of pigments in architectural and decorative paintings. 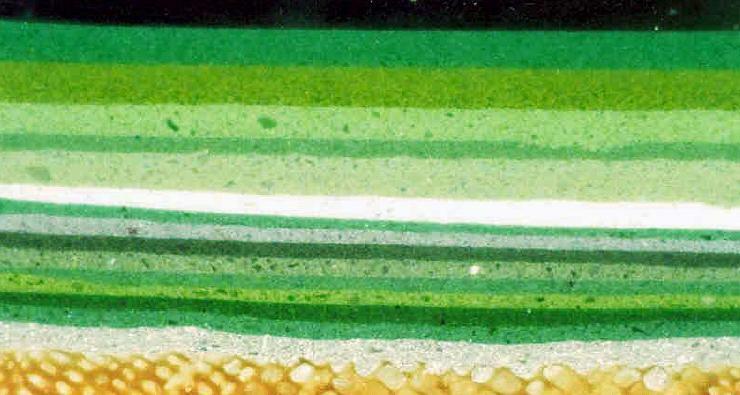 He has kindly answered a question about the paint color “invisible green,” which was left on his previous post, Painting a House During the Regency Era. snatched as by magic from the gazer’s view”. so denominated from its being proper for covering gates and rails in parks, pleasure grounds, etc. 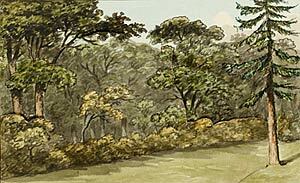 by rendering them in a measure invisible at a distance on account of its approximation to the hue of the vegetation”. One of my early projects was at Uppark, where the young Emma Hamilton is alleged to have danced naked on the dining room table. 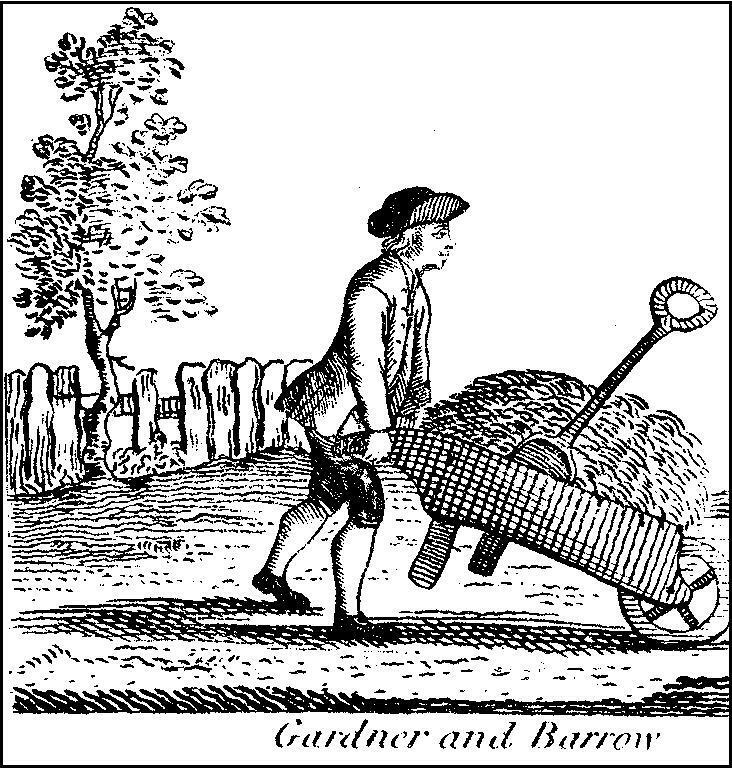 The wonderful Lucy Inglis has written very well in her blog Georgian London about the concept of prostitution in the eighteenth century in Frances Barton – Alimony and Acting: The Life of Nosegay Fan. 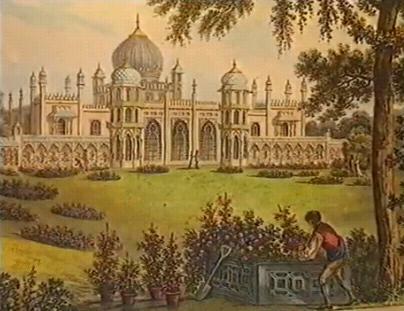 Second image by Sir Humprhy Repton of a garden building for the Royal Pavillion at Brighton. The design was not used. 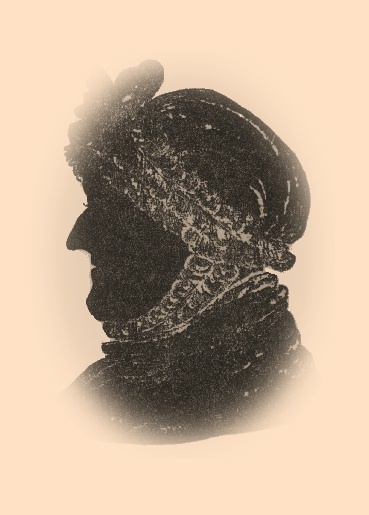 “MY DEAR MARY, – The very day after I wrote you my last letter, Mr. Hill wrote his intention of being at Adlestrop with Mrs. Hill on Monday, the 4th, and his wish that Mr. Leigh and family should return with him to Stoneleigh the following day, as there was much business for the executors awaiting them at the Abbey, and he was hurried for time. All this accordingly took place, and here we found ourselves on Tuesday (that is yesterday se’nnight) eating fish, venison, and all manner of good things, in a large and noble parlour, hung round with family portraits. The house is larger than I could have supposed. We cannot find our way about it – I mean the best part; as to the offices, which were the Abbey, Mr. Leigh almost despairs of ever finding his way about them. I have proposed his setting up direction posts at the angles. I had expected to find everything about the place very fine and all that, but I had no idea of its being so beautiful. I had pictured to myself long avenues, dark rookeries, and dismal yew trees, but here are no such dismal things. The Avon runs near the house, amidst green meadows, bounded by large and beautiful woods, full of delightful walks. “At nine in the morning we say our prayers in a handsome chapel, of which the pulpit, &c. &c., is now hung with black. Then follows breakfast, consisting of chocolate, coffee, and tea, plum cake, pound cake, hot rolls, cold rolls, bread and butter, and dry toast for me. The house steward, a fine, large, respectable-looking man, orders all these matters. Mr. Leigh and Mr. Hill are busy a great part of the morning. We walk a good deal, for the woods are impenetrable to the sun, even in the middle of an August day. I do not fail to spend some part of every day in the kitchen garden, where the quantity of small fruit exceeds anything you can form an idea of. This large family, with the assistance of a great many blackbirds and thrushes, cannot prevent it from rotting on the trees. The gardens contain four acres and a half. The ponds supply excellent fish, the park excellent venison; there is great quantity of rabbits, pigeons, and all sorts of poultry. There is a delightful dairy, where is made butter, good Warwickshire cheese and cream ditto. One manservant is called the baker, and does nothing but brew and bake. The number of casks in the strong-beer cellar is beyond imagination; those in the small-beer cellar bear no proportion, though, by the bye, the small beer might be called ale without misnomer. This is an odd sort of letter. I write just as things come into my head, a bit now and a bit then. “Now I wish to give you some idea of the inside of this vast house – first premising that there are forty-five windows in front, which is quite straight, with a flat roof, fifteen in a row. You go up a considerable flight of steps to the door, for some of the offices are underground, and enter a large hall. On the right hand is the dining-room and within that the breakfast-room, where we generally sit; and reason good, ’tis the only room besides the chapel, which looks towards the view. On the left hand of the hall is the best drawing-room and within a smaller one. These rooms are rather gloomy with brown wainscot and dark crimson furniture, so we never use them except to walk through to the old picture gallery. Behind the smaller drawing-room is the state-bedchamber – an alarming apartment, with its high, dark crimson velvet bed, just fit for an heroine. The old gallery opens into it. Behind the hall and parlours there is a passage all across the house, three staircases and two small sitting-rooms. 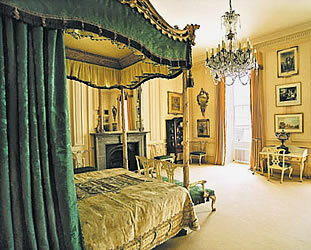 There are twenty-six bedchambers in the new part of the house and a great many, some very good ones, in the old. There is also another gallery, fitted up with modern prints on a buff paper, and a large billiard-room. Every part of the house and offices is kept so clean, that were you to cut your finger I do not think you could find a cobweb to wrap it up in. I need not have written this long letter, for I have a presentiment that if these good people live until next year you will see it all with your own eyes. “In landscape gardening everything may be called a deception by which we endeavour to make our works appear to be the product of nature only. We plant a hill to make it appear higher than it really is, we open the banks of a natural river to make it appear wider, but whatever we do we must ensure that our finished work will look natural or it would fail to be agreeable.” Agreeable meant adding cattle or deer as focal points, and architectural structures that drew the eye. At times, entire villages were transported away from the great house and mature trees were transplanted so that the bucolic vision of manse and land could remain unspoiled and natural. “The perfection of landscape gardening consists in the four following requisites. First, it must display the natural beauties and hide the defects of every situation. Secondly, it should give the appearance of extent and freedom by carefully disguising or hiding the boundary. Thirdly, it must studiously conceal every interference of art. However expensive by which the natural scenery is improved; making the whole appear the production of nature only; and fourthly, all objects of mere convenience or comfort, if incapable of being made ornamental, or of becoming proper parts of the general scenery, must be removed or concealed”. “It would be delightful to me to see the progress of it all,” said Fanny. Hayes Image: Lasdun, Susan. The English Park, Royal, Private and Public. London. 1991, p 103. Print. 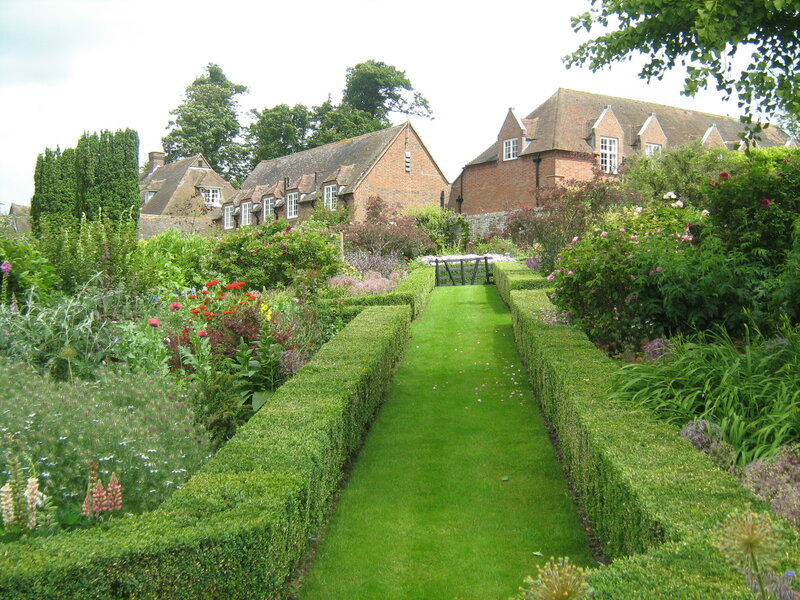 The Gardens of Jane Austen’s England are a series of photos taken on a tour group in 2007. 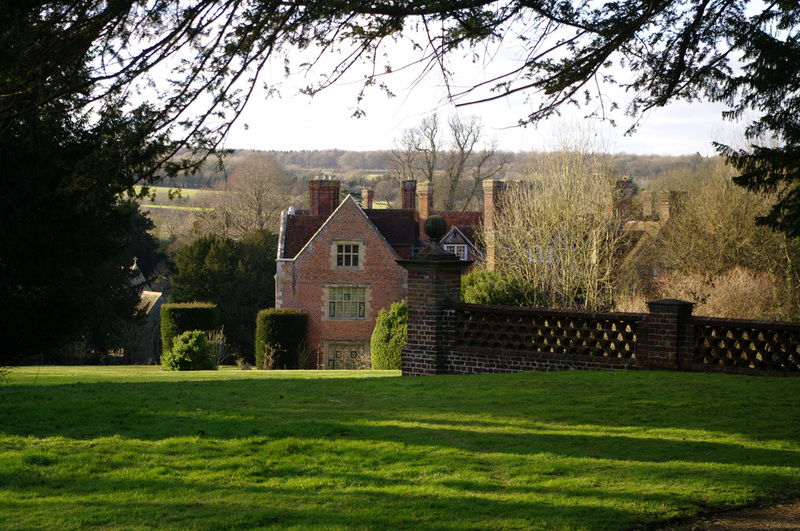 Click on the site to find images of Jane Austen’s houses and locations of her film adaptations. 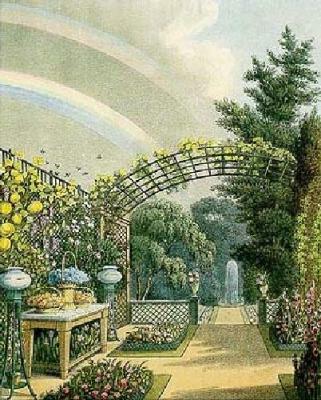 The Royal Horticultural Society writes about the Royal pavilion’s restored Regency gardens, and defines the Regency garden style in this short article. 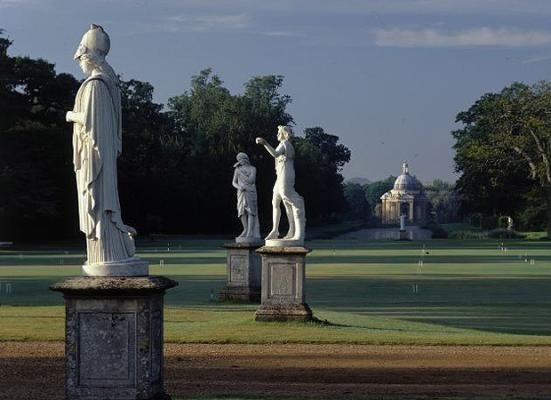 Famed landscape architect Humphry Repton worked on the gardens at Stoneleigh Abbey. These images show the mansion and its surroundings before and after Repton’s changes, in which the house becomes integral to a natural looking landscape. Jane Austen’s Life and Works in Google Earth is an amazingly detailed site that lists every location Jane visited, lived in, or mentioned in her novels. Download Google earth, and see images of these sites as taken from above. Find a direct link to the site here. 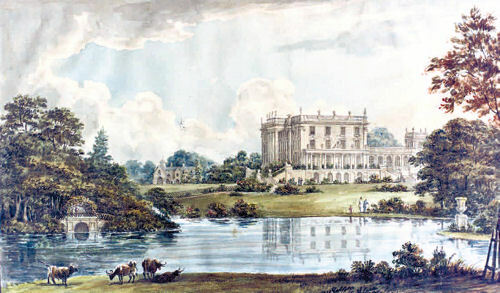 Mansion Illustrations from: Humphry Repton at Stoneleigh Abbey, Warwickshire, by Edward Malins, Garden History, Vol. 5, No. 1 (Spring, 1977), pp. 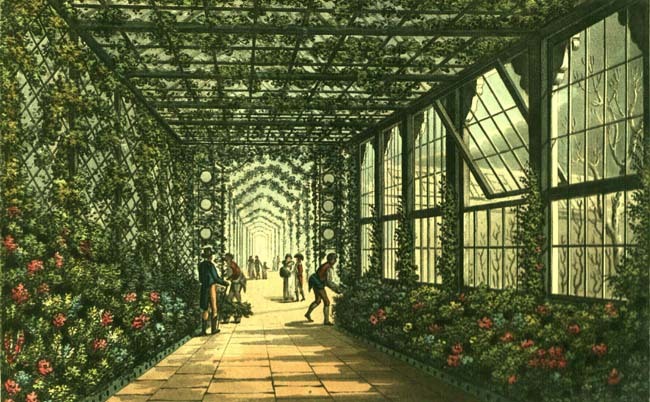 21-29, Published by: The Garden History Society.